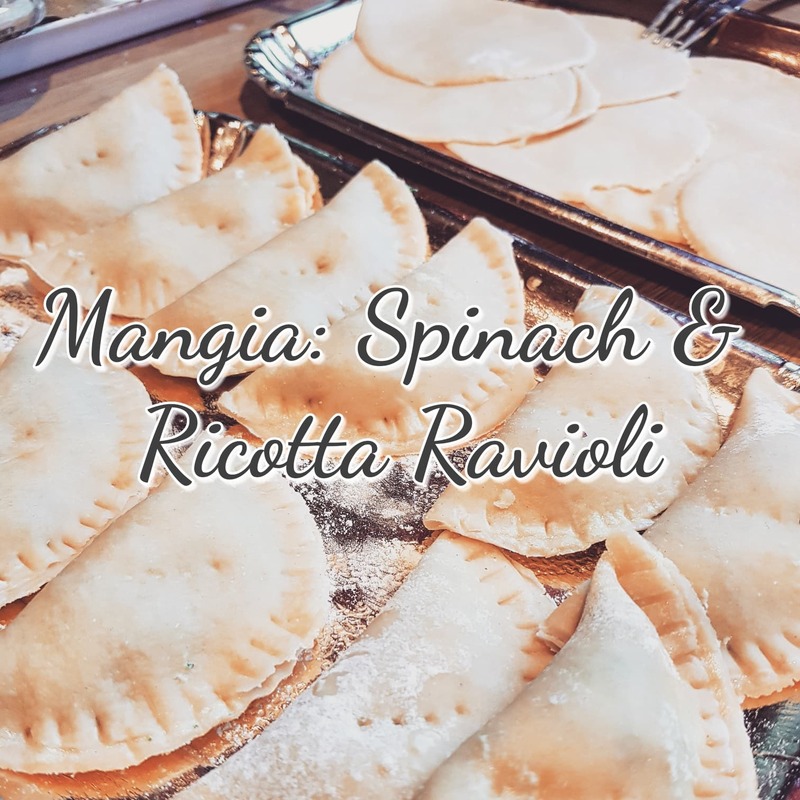 Mangia: Spinach and Ricotta Ravioli. Like elves at Christmas time when we cooked with Grandad there was always a production line, starting in the kitchen and floating out in to the dining room. We all had our stations and would listen closely to what Grandad was instructing us to do. Sometimes we would try our hand at what someone else was doing, wanting to know it all, but more often than not we would take great pride in making sure we were doing the task we had been given to the best of our ability. Start by chopping your garlic and adding it to a frying pan with a drop of oil. Throw in your spinach, season with salt and pepper and once it is cooked, set it aside to cool. In a bowl, or we like to use Grandad's baking trays, take your flour and make a well in the middle. Add your eggs, a dash of salt and use a fork (or your hands) to combine. If your dough is sticky you can add a few drops of water at a time, or Nanna recommended olive oil or milk. If the dough is too sticky dust a little more flour over the top and continue kneading. Place your pasta dough on a dry tea towel until ready to use. As you cut off slices to put through the pasta machine, keep the rest covered with your tea towel so it doesn't dry out. Take 1cm strips of pasta, simply cut away from your dough with a knife, and place it through your pasta machine at 0. Do this a few times, folding and putting it through until you have a lasagna like sheet. Once your shapes are prepared and your spinach has cooled. Add your ricotta to your spinach and your grated cheese. Season with salt and pepper and combine. Now, here you can place your mixture into the center of your ravioli circle and place another circle on top (which we are going to try next time) or you can place a little to one side and fold over. Gently press the edges closed with a fork and a little milk wash to seal. We then placed our ravioli in boiling water (with a tsp of salt) and cooked for around 12-15 mins. Serve with a delicious homemade tomato sauce and buon appetito. Thanks for sharing another great family recipe! :) I love the idea of a cooking assembly line. It makes me think of all the times I would help my dad cook! How I miss those moments!